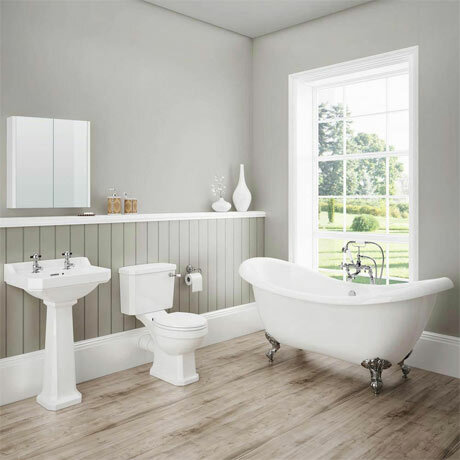 The Darwin traditional bathroom suite, evoking the classical style of a bygone era, yet manufactured to today's high exacting standards, this stylish traditional bathroom suite is perfect for providing a period look in any home. Features a quality close coupled toilet, a 2 tap hole basin with full pedestal and a stunning double ended roll top slipper bath with traditional chrome leg set. Wooden toilet seat is available in a variety of colours & finishes. Taps, wastes any other ancillary items shown in photograph not included.